The Mint Act of April 2, 1792 set the dollar as the base unit of United States coinage. Congress envisioned the new dollar would replace the Spanish Eight Reales (also called Pillar dollars or Pieces of Eight), which for many years circulated readily throughout the New World. Since the U.S. was a nation unto itself now, lawmakers sought to help shape an American identity through its coinage. The first U.S. silver dollars were coined on Oct 15,1794. On that day, 1,758 of them were produced, but no more the rest of the year. Of that number, only about 130 are estimated to survive today. 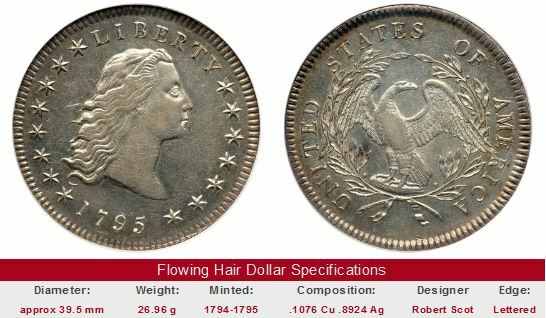 The first U.S. dollar is called the Flowing Hair type, for that describes Liberty's portrayal on the obverse. Henry W. DeSaussure was appointed by President Washington in July 1795 to replace the first Mint Director, David Rittenhouse. DeSaussure remained in this position only four months, but he made a lasting mark by bringing in Gilbert Stuart, the celebrated painter, to redesign Liberty. 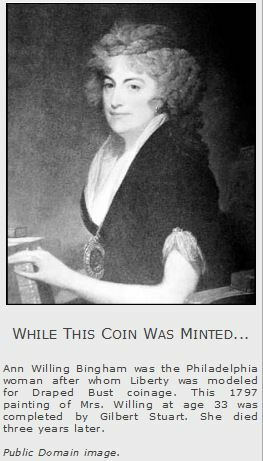 The result was a new coin called the Draped Bust Dollar, featuring a matronly Liberty of considerable endowment wearing a draped blouse. The reverse displayed a smallish eagle very similar to that of the Flowing Hair design. Over 40,000 Draped Bust dollars were minted in 1795. The following year, all the smaller silver denominations adopted the Draped Bust theme. In 1798, the small eagle was replaced by a larger, "heraldic" eagle and shield, an image more suggestive of national power and strength. Nearly 1.5 million silver dollars were coined from 1794 to 1804. Unfortunately, not many remained in circulation for very long. One scenario leading to the disappearance of the coins is when bullion profiteers discovered that the U.S. dollar could be exchanged one-for-one with the Spanish Pillar dollar in the West Indies. 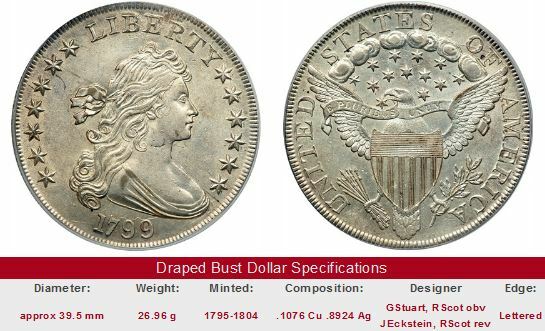 This proved to be a favorable transaction for them, because the U.S. dollar contained less silver compared to the Pillar dollar, when both exhibited minimal wear. The Pillar dollars were deposited at the Philadelphia Mint, where they were re-coined into a larger number of U.S. silver dollars. The new silver dollars were transported back to the West Indies, where the sequence started over again. Acting to abolish this abuse, Mint Director Elias Boudinot discontinued the silver dollar in 1804 (though all dollars coined in 1804 were dated 1803), with the later approval of President Thomas Jefferson. That was the last of the U.S. silver dollars regular production until 1836. The Flowing Hair and Draped Bust types are often lumped into a numismatic category called Early Dollars. All Early Dollars are important historical artifacts dating from the infancy of the United States, but only a tiny percentage, perhaps 3% or so, of the original mintage has survived to this day, so all of them are relatively rare. Collectors especially enjoy studying the many varieties of Early Dollars. Most of the varieties are defined by the number and arrangement of the obverse stars. The rarest Early Dollar is the 1804. Most people are surprised to learn that these were not minted until 1834. That year, the U.S. Department of State desired to send Proof set gifts to the Sultan of Muscat and the King of Siam. Mint officials hoped to provide examples of all U.S. coin denominations, but they had a problem finding a current dollar specimen, since dollar coinage was officially halted in 1804. Not wanting to give the appearance of violating the suspension, the Mint crafted new 1804-dated dies, and struck a few "1804" dollars. In the late 1850's, several 1804 re-strikes were produced for the benefit of cozy collector friends of the Mint. Today, we know of the existence of only 15 of the 1804 dollars. It is one of the greatest prizes in all of American numismatics, and creates headlines when one changes ownership. In April 2008, a professionally cleaned specimen, graded PF-62 by NGC, was sold for $3.738 million. Since the 1804 is beyond the reach of most collectors, what are the key date Early Dollars? Next in line is the 1794. As already mentioned, it too, is very rare, and priced accordingly. Should you be in a financial position to afford such a rarity, the 1794 ought to be one of the rare coins at the top of your list, for it has an unrelenting record of value growth. In May 2010, a 1794 dollar set a record price for the sale of a U.S. coin. The dollar is believed to be the very first silver dollar minted by the United States. It was graded at MS-66 by PCGS, and sold for $7.85 million. This exact same coin sold for $10.02 million in January 2013! Most other Early Dollars resemble one another in terms of value trend histories, having shown steady, but not spectacular increases over a period of many years. Collectors can buy these Early Dollars in confidence, knowing they'll be worth considerably more in the years ahead, while rejoicing in the thought of owning a coin perhaps once gazed upon by a Founding Father. It is preferable to buy Early Dollars that have been certified by one of the four leading grading service companies: PCGS, NGC, ICG, or ANACS. If not, then make sure the seller is someone of unquestioned reputation. The links below take you to eBay coin auctions. For the 1794, probably the only thing for sale are replicas, which have no numismatic value. Eventually, the real thing will pop up, so be watchful. The other link brings up other Early Dollars currently available on eBay. Trend data for the 1796 (Small Date, Small Letters variety) is shown to typify Early Dollar price movements.